If you want to visualize what a tibiofemoral dislocation looks like on an X-ray, don’t say we didn’t warn you. Doctors said Bridgewater didn’t have any nerve or arterial damage, and considering the severe bone displacement associated with the injury, we’re stunned that he avoided such issues. Remember, this was a non-contact injury, so from the information we have, Bridgewater’s knee essentially exploded just from him running around. Credit is due to the Minnesota trainers, because to go from nearly losing your leg to a long-term prognosis of returning to football is an amazing turnaround. But seriously, how can a non-contact injury be so severe? 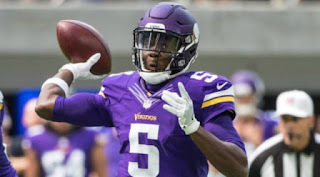 Now that the immediate medical danger has passed for Bridgewater, the focus will turn to the Vikings’ replacement for him this season. Shaun Hill is the backup on the roster, and Colin Kaepernick is reportedly available for trade, but if Minnesota’s front office is reportedly like most of them out there, they are too concerned with his protests to pick him up.